The 3-Day blog is excited to welcome back Dr. Sheri Prentiss, the National Spokesperson for the Susan G. Komen 3-Day®. 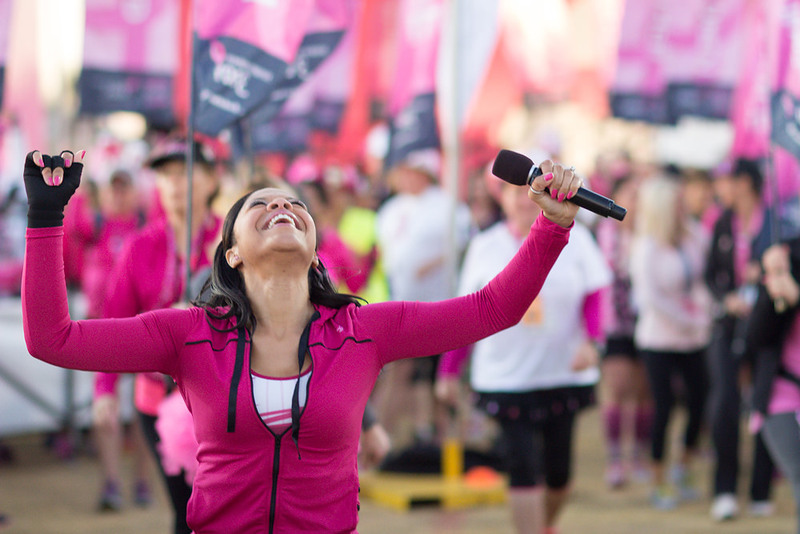 Dr. Sheri is a physician, as well as a breast cancer survivor and a 3-Day walker herself. She joins us today to share some warm weather training tips to keep you in tip-top shape along your training route as you prepare for an amazing 60 miles. As I continue my training efforts for the upcoming Komen 3-Day season, I personally am reconnecting with nature, body and mind. 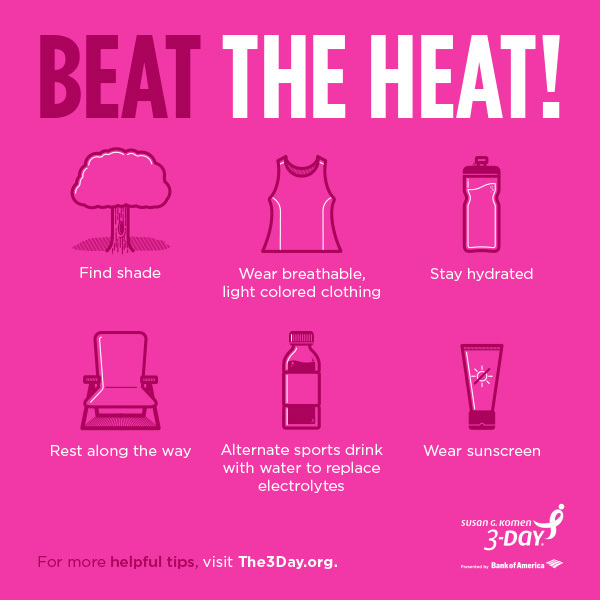 I’m invigorated by the sights, sounds and scents of summer and am grateful for life, health and a chance to win what I feel may be the biggest fight ever fought – the fight to end breast cancer. Training for your 3-Day event means you, too, will be spending more time outdoors! Now is a great time to review a few tips to help keep you safe as you train and soak up this summertime weather. Protect your skin. Wear a high SPF sunscreen and don’t forget the back of your neck, the tip of your ears and your hands. It’s always a good idea to wear a hat to protect your scalp from the sun, too. Also, look for a route that offers both sunlight and shade. Keep as cool as you can during your training walks by always choosing to walk on the shady side of the street where you have a choice. But use caution, as going from shade into sun you may not see road hazards as well. Wear light-colored and lightweight clothing that is made from moisture-wicking fabric; this keeps moisture away from the skin and dries quickly. This also includes moisture-wicking socks to help prevent blisters. Up your intake of water. If you’re walking, you need more than the standard eight ounces of water eight times a day. Take a reusable water bottle with you on your walk. Alternate drinking salt-replenishing sports drinks and water. Also be sure to bring along salty snacks for those longer training walks. Once you are started and you can feel the temperature rising, pay attention to your heart rate. Your heart rate will naturally rise one beat per minute for each degree above 77F, so while you may not be going faster, your body is already working harder and producing more internal heat so it will have trouble dispersing. Hot weather is no time to set a pace record. Slow down to a pace that doesn’t leave you purple in the face! Don’t keep walking once you are nauseated, dizzy, feeling faint, experiencing gray-outs, headache and/or muscle cramps. Seek shade, sports drink, and call for help. Always be sure to put your well-being first when training, especially in the heat of the summer months! Dr. Sheri’s tips are right on the money. Living in Georgia-and having lived in the Philippines-I can vouch for her hints. I try to wear tech tops to wick moisture-or lightweight fabrics. I find it’s good to wear acrylic blend socks-and through a recommendation from a 2 Day coach-tried low and no-show socks. I was skeptical that keeping your ankles cool would help-but it does! A way to remember to hydrate properly is this little ditty ‘Drink, drink, pee, pee, we don’t want an IV.” Because if you neglect your hydration-you will wind up in the ER with a saline IV! Be safe and stay cool! Sherry Lazzaro, 7th yr 3 Day Crew (come see me in Camp Services! )PS-those tech cooling towels you wet and snap do work too! Thanks for commenting! You have some great suggestions too, and I can’t agree more on the little ditty about hydration. Can’t wait to see you this year in Camp Services!